Too Faced Sketch Marker Liquid Liners for Fall 2016 | Top Beauty Blog in the Philippines covering Makeup Reviews, Swatches, Skincare and More! Sketch Marker is an advanced liquid eyeliner inspired by Japanese Calligraphy Pens. Its formula acts as an artist’s best drawing ink, created to be exceptionally smooth, vivid, waterproof and ideal for lining eyes. The flexible tip allows you to effortlessly create paintbrush-like strokes for daytime to dramatic cat eyes and everything in between. Available in a kaleidoscope of colors from soft pastels to bold pop art shades. 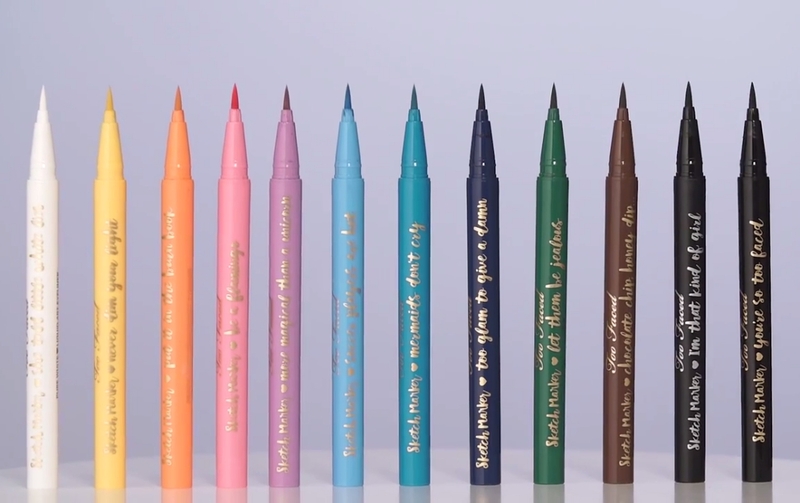 Wear a single color or pair up to create a double eyeliner work of art. Love that deep lilac colour! Wow, so many wonderful colors! Goodness I need one (or more) of those! Wow these look like real art markers!